We were at CodeMash this year when we heard the news. The news was about our friend Jim Holmes, the man who started CodeMash and ran it until a couple years ago. Jim had just lost his wife - killed in a violent incident. Obviously, Jim was not coming to CodeMash as planned; he turned around headed back home. Meanwhile, us - his friends - were left in shock. We were fortunate that we had each other to talk to and help one another deal with this tragedy. It was a helpless feeling. We wanted to do something. I wanted to do something. Although I did not know Pam well, Jim has been a friend and mentor since we first met at a Red Robin in Columbus, OH in 2007. Over the years, Jim has done me a number of personal kindnesses - some large and some small and he has done much to help the software community in general. We began with a fundraising effort. We created a campaign on gofundme.com, allowing friends and others to contribute some money to Jim's family - money to allow him take time off work and focus on his family and dealing with the aftermath of this tragedy. I was overwhelmed to see the campaign raise over $30,000 in the first week. It now stands at over $40,000. As the administrator, I found myself adjusting the campaign goal upward 4 different times. It helped me to see the outpouring of love and cash from those who felt a connection with Jim. It helped me to deal with the helplessness I was feeling. When I learned the funeral details, I wanted to attend. But there was a problem. In 2015, Jim and his family moved to Ashland - a small town in southwest Oregon. Every airline route I found consisted of 3 flights and a full day of flying. When I heard that Sara Ford was driving up from her home in San Francisco, I reached out to her and asked if she wanted company. I booked a flight to SFO and Sara picked me up and we drove the 400 miles together. Ashland, OR is a difficult place to get to - especially from the Midwest. CodeMash takes place in the Midwest and flights from Midwestern cities to small-town Oregon are difficult to arrange. As a result, very few from the developer community were able to take time off work on short notice and spend a full day traveling there and a full day traveling home. So Sara and I arrived at the funeral carrying greetings sympathy and hugs and love from many who could not make it. We were fortunate to have flexible schedules. But we had the responsibility to tell Jim and his family what they already knew - that those he knew and those he helped over the years were thinking of him and his family and praying for them all. The funeral was sad of course. But it was not all sad. The Eulogy was read by the minister who married Jim and Pam a quarter century ago. And he spoke a lot about love and forgiveness - even for the one who killed Pam. I've heard Jim echo these thoughts and it's an attitude that not everyone takes and it's refreshing and humbling. For me, the hardest part of the service was seeing Pam's mother say goodbye to her daughter. It brought back memories of my mother dealing with the death of my sister 7 years ago. I spoke at length with Jim's parents and some of his siblings, who I found to be charming people. I was able to offer my condolences to Pam's mother and daughter. I met many of the Wolosz and Holmes family and I was impressed with them all. We attended the funeral and the reception afterward, before getting back in the car and driving back to San Francisco, so I could catch an early morning flight home. I flew about 4500 miles and drove about 800 miles in less than 2 and a half days. I would do it again in a heartbeat. I'm really glad I went. I think it helped Jim that I was there. But I know it helped me. After all these years, Webb Wilder still knows how to rock. Last night, during my first visit to Fitzgerald's in Berwyn, IL, I had my first experience seeing Webb live. The small club was packed, but I was lucky to find a seat with 2 friends who had an extra chair at their table. When the show started, I gave up my seat to an elderly woman and moved up to watch the show next to the stage. For over 2 hours, Webb and his band - The Beatniks - showed off some amazing guitar work. They moved effortlessly between the rockabilly of “Ju Ju Man” to the psychedelic "Voodoo Witch" to the hard rocking "Sitting Pretty". The band was an excellent collection of musicians. Just 2 guitars, a bass guitar, and drums filled the place like a much larger band. The lead guitarist (I cannot find his name online) manipulated a control panel at his feet to make it sound as if he were playing dozens of different guitars. Now in his 60s, Webb Wilder still brings the energy of his shows at small clubs like Fitzgerald's. If you are a fan of roots rock, I recommend seeing him live. Tristan Thorn was born in the town of Wall - so named because of the giant wall that separated the village from the mystical land of Faerie. His father was a mortal in Wall and his mother was a magical woman from Faerie. As a young man, Tristan fell in love with the beautiful Victoria Forester. To win her love, he promised to bring back the star they saw falling into the land of Faerie. So Tristan set out on his quest across the forbidden land. But Tristan was not the only one seeking the star. Just before he died, the Lord of Stormhold (a Faerie kingdom) promised his throne to whichever of his sons could retrieve the star. And three ancient witches sought the star because its heart would bring them eternal youth. Tristan finds the star, which we discover is actually a young Faerie woman named Yvaine, who has broken her leg in the fall from the sky. He sets out to bring her back to Victoria, loses her, finds her again, and encounters a number of adventures as he crosses the magical lands. 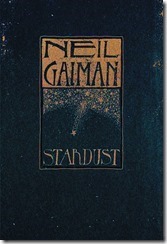 In "Stardust", Neil Gaiman creates a world of beauty and wonder and characters both real and magical. The writing style is one of epic fantasy and the prose is beautiful. Stardust is a fairy tale for adults and I enjoyed it immensely. I began 2016 with a big change. After more than 18 months living in the Old Town neighborhood of Chicago, I moved to the South Loop. I liked Old Town, but I felt it was time for a change and I wanted to experience a different part of the city. I chose the South Loop because it is close to my office; because it was a neighborhood I did not yet know well; and because I liked the apartment I found. I moved into a high rise in late January and I really like it - especially the view of the city from my balcony. I spent a good part of 2016 on the road - much of that travel in my car. I made numerous to Champaign, IL, working with professors at the University of Illinois, organizing workshops, and guest lecturing. I drove to Minneapolis and to Lexington, KY and to Columbus, OH and to Appleton, WI and to Bloomington, IN. There weren't many parts of the Midwest I did not drive to. One trip took me from Chicago to Columbus, OH to Detroit to ann arbor to East Lansing to Appleton, WI to Milwaukee. On another, I drove from Chicago to Champaign to St. Louis; then flew to Austin, TX before returning to St. Louis and driving home. But the most tiring trip was when I flew to Sydney, Australia for 3 days to speak at the NDC conference. It took me 2 full days to get there and I ended up spending 24 hours in Vancouver and sleeping on an airport couch thanks to a mistake by United Airlines. When I returned to the US, I drove from Chicago to Wisconsin Dells for another conference; then up to Minneapolis for still another. The year began with a trip to Sandusky, OH to celebrate the 10th year of CodeMash and it ended with a drive back to Michigan to spend Christmas with my family. It was often tiring, but I'm glad I did it. I got to speak at some amazing conferences and met some amazing people and visited some amazing places. In Australia, I spoke at the prestigious NDC conference for the first time; and to have dinner with my sister-in-law and niece, who live near Sydney. In May, I visited Romania to speak at IT Camp for the third year in a row. This is becoming one of my favourite conferences. On this visit, I decided to spend a few days in Bucharest prior to the conference. It was an eye-opening experience as Bucharest is a formerly great city that is still trying to recover from the damage caused by Nicolae Ceaușescu and his misuse of public funds. Overall, it was a satisfying year professionally. When I got enough sleep, I enjoyed it immensely. And when I did not, I tried to schedule an off day or a couple late mornings to catch up on sleep. Personally, this year was also very good. I'm continuing to work on improving my health. I hired a personal trainer and have been working out regularly. My heavy travel schedule made it difficult for me to eat well, so I gained some weight in the fall but I've already begun to lose it again. I found a new doctor in the South Loop and scheduled and "annual" physical - something I had ignored for a long time. I scheduled 2 sleep studies and I am now the proud owner of a cpap machine which promises to help me to sleep more efficiently. My 2 boys (now 2 grown men) continue to make me proud. Nick accepted a job as Director of Basketball Operations Southern Illinois University - Edwardsville and Tim will graduate from Indiana University with a degree in Informatics. I had a number of visitors stay with me this year, including my sons, Rowena and Sabrina (my brother Dan’s wife and daughter), my friend J from Grand Rapids, my college friend Randy, and my friends Adam and Szofia from Budapest. Other friends (Dave from Florida, Sven from Alabama, Gary and Patricia from Kentucky, and others I cannot remember today) made time to meet up with me while they were in town. I met a lot of new people in 2016. Most treated me well and a few treated me very well. I met a nice girl a few months ago, and that relationship is going very well. I made an effort to rekindle my passion for live music and theater, taking advantage of the numerous venues in Chicago. I saw a few plays, including “Stomp”, “The SpongeBob Musical”. and “C.S. Lewis: The Most Reluctant Convert”. I saw some old favourites in concert, including Steely Dan, Stanley Clarke, and Gary Numan. Chicago has an impressive list of theaters – large and small – and I'm trying to take advantage of this. I continued my efforts to keep a positive attitude by starting each morning thinking of something for which I am grateful and posting that thought on social media. In addition to Facebook and Twitter, I now also record a video of this thought and post it to Instagram. Technology and Friends - my online TV Show - continues to go strong as I passed 450 episodes in 2016. I expect to air show #500 this year! 2016 began with a big change as I changed my home base, but I spent much of the year working on things I started in 2015. Only harder. The Illustrated Man despised the tattoos that covered his body. In the daytime, they were beautiful works of art; but at night, they came to life and told stories that predicted the future. And they always predicted a bleak future. The Illustrated Man by Ray Bradbury is a collection of the stories told by the pictures on the circus refugee's body - 18 dark tales of science fiction and horror. Bradbury frames the collection by narrating an encounter with the Illustrated Man along a deserted road and relaying the stories acted out by the animated tattoos. Some of the stories take place on Mars - the site of Bradbury's most famous short story collection - but do not necessarily share continuity with his "Martian Chronicles" stories. The stories have no common thread, but they are all dark and many explore how man's psyche deals with his place in the universe. In "Kaleidoscope", the doomed crew of a crippled space ship reflects on their lives as they float to their deaths. The last survivor laments that there is no way he can perform a good act to make up for his "terrible and empty life". In "The Other Foot", a future Mars is colonized entirely by black people. When Earth is destroyed by nuclear war, spaceships filled with white people arrive, asking to be allowed on Mars, acknowledging the oppression they perpetuated that caused the blacks to flee in the first place. "Marionettes, Inc" could be a Twilight Zone script. A company will sell you a robotic replica of yourself, so you can escape your responsibilities without your family knowing. Predictably, it all goes horribly wrong for the customers. The edition I read included the origin story of The Illustrated Man (some editions omit this story), which is the tragic tale of a carnival worker who tries to salvage his marriage and his job by accepting an offer to be completely tattooed by an old witch. This collection is a good introduction to Ray Bradbury and a good read for those who already enjoy his writings. Will and Jim were 13 years old when the circus marched into their small town in the middle of an October night. But there is something wrong with this circus and its creepy proprietor, the tattooed Mr. Dark. The Merry-Go-Round has the power to change a rider's age: The rider ages if they ride it in the forward direction and becomes younger if they ride it backwards. One catch: Riding the merry-go-round binds the rider to Mr. Dark's servitude forever. Both boys are anxious to grow up and are tempted to take the magical ride. Adventurous Jim insists on trying, but cautious Will holds him back. When Mr. Dark learns that they know his secret, he and his minions attempt to capture the boys and their families. What ensues is a battle of good against evil in a dark horror fantasy novel. Will's father - tempted to ride the merry-go-round backward - joins with the boys to battle the evil carny. The 3 of them battle for their souls and the souls of the townsfolk. Something Wicked This Way Comes is a coming of age story in small-town America; It is a classic horror fantasy novel; and it is an adventure story.